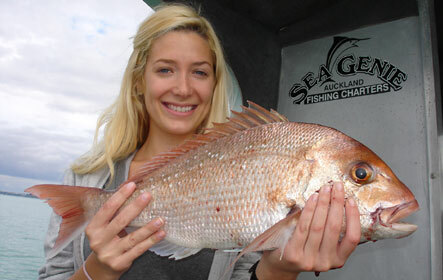 What times are fishing trips available? Trips are booked on an individual basis with a start time to suit you, and when we are available. The sooner you make your enquiry (see enquiry form and email or call on 0274152487 or 09 5794887) the better chance you will have to get a date and time to suit you and your party. Our service is completely customised to allow details like the departure and return time made to suit you, unlike "party boats". Likewise if there is a change in your plans during the trip we can accommodate this. You will find us very flexible. Where do we depart and what is the parking arrangement? Departure is from Auckland waterfront, Orakei Marina. You will be advised of the exact point on enquiry. There is free parking available. Do I need to have any fishing experience? 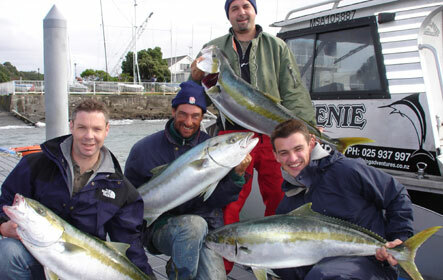 Individual attention and assistance is given freely to every customer on all of our fishing charters. This has won customer loyalty and is noted as a point of difference between our service and others. What should I bring along on my fishing trip? Clothing should include something warm and a windbreaker in winter, sunglasses, sunblock and hat in summer. Footwear is advised, please show respect with non marking soles or soiled boots. Do I need fishing equipment? 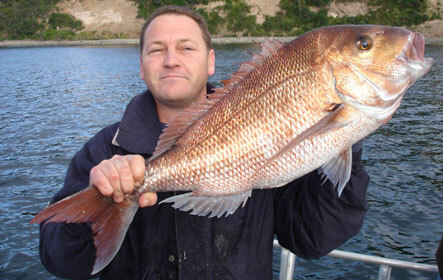 You are welcome to bring on board your own rods and reels and tackle. There is ample room for safe storage. 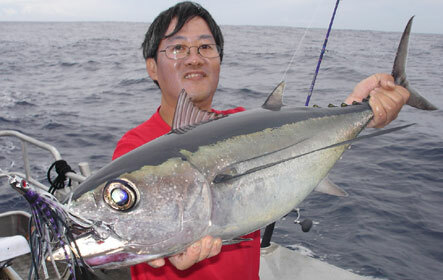 Surfcasting rods and handlines are not appropriate for this style of fishing. 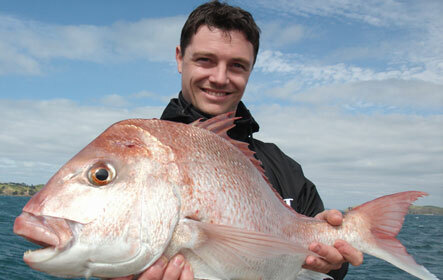 We carry a good selection of fishing gear for hire with free tackle. Most of this gear is top class Shimano and Penn gear. Lures are available at cost. You need to advise us prior to the trip how many people need equipment. 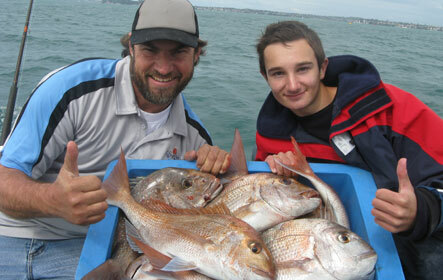 Are children catered for on fishing trips? We suggest the minimum age of 5 years on boat charters. The boat has substantial railing for their safety. We suggest that youngsters bring and wear their own lifejacket if they have one. Smaller sizes are carried on board. Younger children must have a dedicated caregiver while onboard the boat. Do I need to book the whole boat? 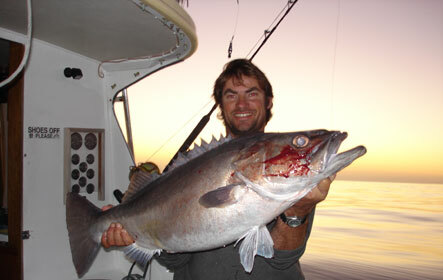 It is best to arrange your own group for economy and enjoyment, it is always better to fish with your friends. We can make up 'shares', i.e half , to accommodate you and we often make price adjustments to make it work for you. If you send in the enquiry form and advise us of your group size we can discuss the options to make a trip to suit you and your budget. Are there licenses and what are the fishing rules? 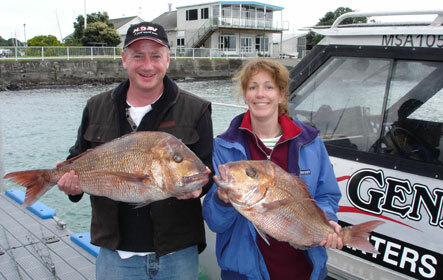 There are no licenses for fishing in the sea in New Zealand. 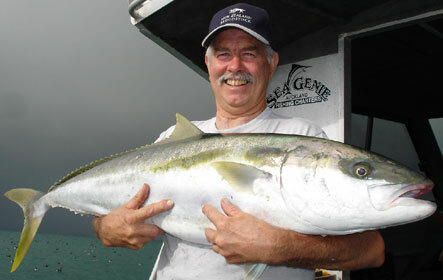 The fisheries rules as to bag size and minimum sizes for species will be explained and managed by your skipper during the trip. A reasonable amount of alcohol is permitted to come on board. This has to be declared to the skipper on boarding and excess may be left behind. Passengers are not permitted to be intoxicated, and it is the discretion of the skipper on this matter and a return to shore can be ordered. Is food or refreshment available? Lunches and snacks are BYO. A BBQ lunch can be cooked for you at no charge if the charter brings the supplies. Catering can be arranged for larger groups, prices and options on application. Chillybins are not required and are best left in your car on return. Fish are stored in a large iceyteck fisbin on board and separate black sacks can be used in there for caught fish. Ice is provided. Chillybins can be brought with food and cold drinks for the day. Fill out the enquiry form and email with any queries, i.e available date options you may want and your group size, or you may want to call 0274152487 or 09 5794887 and talk direct to ask questions and find out the latest.